Ex-MK Ben-Ari responds to election failure, indicates movement may shift in focus to new media outlet, extra-parliamentary activity. Former MK Dr. Michael Ben-Ari, chairman of the Otzma Yehudit party, whose candidate Baruch Marzel ran on the number four spot of Yachad - Ha'am Itanu's joint list, responded to the list's failure to enter the Knesset and indicated the movement may be about to change its modus operandi. Yachad missed out by a mere 11,000 votes. In the last elections, under the name Otzma Leyisrael, Ben-Ari's party was just over 8,000 short, back before the threshold percentage was raised by the outgoing coalition. "Leadership isn't always cake with icing," Ben-Ari noted on Facebook after the final results were published on Wednesday. However, he vowed, "we will pick up the pieces, quicker than others think. We are not those who despair; it is not for ourselves that we are acting." The ex-MK noted "we have an urgent mission, ideologically deep, in every corner and every site. It will be harder without the Knesset, but it is essential. Before our eyes the state of Israel is being conquered in identity and in deed. No one mentions it. And as long as they are silent, the public gets used to the warped reality." Ben-Ari then spoke about the future of his movement, noting "we will continue with the activities of Otzma Yehudit. With all of the branches that functioned until now and more." "We will also, with G-d's help and the help of good friends, establish an alternative media outlet," he revealed. Indicating a possible shift in focus, Ben-Ari continued "regarding (Knesset) campaigns in other elections, it's too early to decide. It may be that the arena in which we can influence is in different places." "We are still here, without the false honors, and poorer than ever," he wrote. "But with a mission that we cannot run from, for the sake of the coming generations." Ben-Ari thanked Marzel "who led the last campaign," along with Lehava director Bentzi Gopshtain, "whose skills and self-sacrifice are known to us," along with the "brilliant and creative" Attorney Itamar Ben-Gvir, "who, if he had hired out his services to any other party, would have been in a different place long ago." "Now is the test, who will continue with us in the desert; we will know that in the coming days," he concluded. "I too am broken, disappointed, and even crushed, but I definitely am not despairing. I love you all, and the people of Israel, who again turned their backs on us to 'save Bibi (Binyamin Netanyahu).'" "Half-a-million Arab citizens who want to erase Israel"
Candidate Baruch Marzel of Hevron spoke to Yedioth Aharonoth after the results came in, noting the massive Arab voter turnout which led the joint Arab list to reach 14 seats, and become the third largest party in the Knesset. 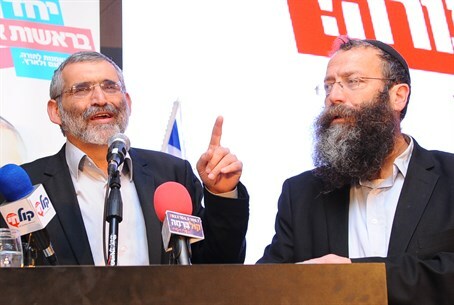 "Half-a-million citizens who want to erase the state of Israel will be represented in the next Knesset," warned Marzel. He noted "that's something that needs to set off red lights for all of us. We will deal with them, we won't let any political terrorist stop us." While some politicians, including on the political right, have said the Arab citizens of Israel are loyal to the state, a poll last November showed 29% of Israeli Arabs blamed the state for the ongoing wave of terror attacks, indicating that a third of Israeli Arabs gave tacit approval to terrorism. Marzel also pledged to continue his struggle against MK Hanin Zoabi, the radical Arab parliamentarian who has openly expressed her support for the Hamas terrorist organization. "I will wipe off Hanin Zoabi's smile also from outside (the Knesset), like we did at the elections conference in Ramat Gan," he said. "I will continue to pursue her in every place because she endangers the state of Israel." The reference to Ramat Gan notes on an incident earlier this month in which Marzel and Otzma Yehudit activists protested outside a conference at a university in which Zoabi spoke. One student in the conference poured juice on Zoabi, who had been making provocative statements targeting the crowd and calling for a state of "Palestine"; police arrested the student for pouring the drink. Echoing Ben-Ari's calls, Marzel said earlier on Wednesday on his Facebook page, "we will continue will full force! If we make it in or not, the Knesset is only a means and not a goal! Our goal is the land of Israel and we will continue to defend it in any situation, from within (the Knesset) or without!"